The history of The Game Crafter is in many ways the history of its founder, JT Smith. In the late 1990's, JT started making his own games under the label Anarchy inK. His first game was an RPG called deadEarth. After the first, he created many more and never really stopped. In those days, JT used domestic and international printers to achieve his game projects. Basically, whatever it took, he made it happen. He was still making the games he wanted to make, but only his. JT often collaborated with friends on game projects. He'd rope in anybody who was the slightest bit interested. That carried through his business life as well. JT is a computer programmer by trade, and used his talents to build many businesses. In January of 2009, the business he was focused on most was Plain Black, a software consulting firm. He and his business partners, Jamie Vrbsky and Tavis Parker, were looking to expand into yet another business, and were throwing around ideas. 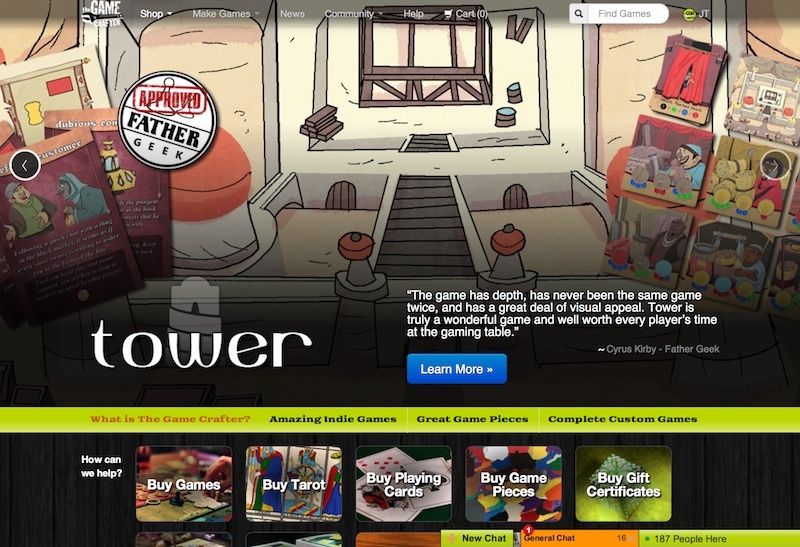 They discussed dozens of ideas, but eventually decided on a crazy idea to create a new version of The Game Crafter that would build not just JT's games, but everyone's games. 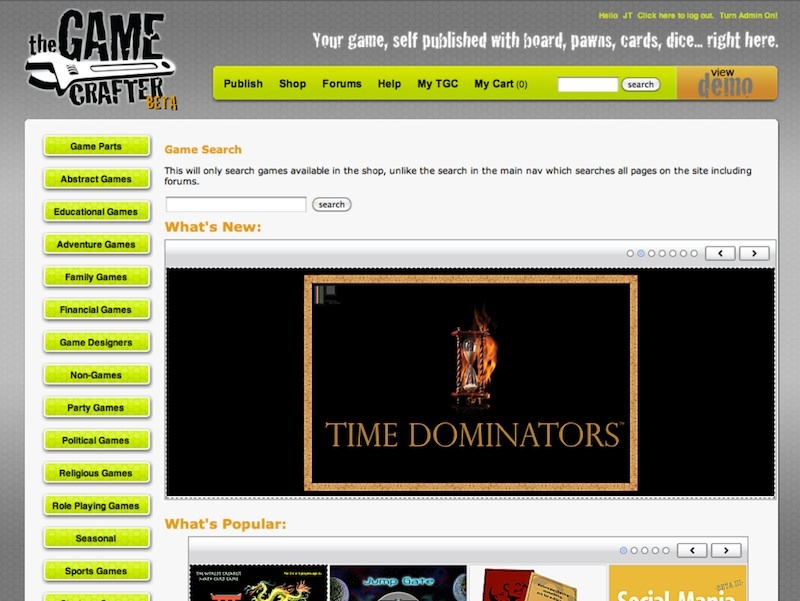 The types of games that JT had been producing through The Game Crafter prior to 2009 were really niche market games--nothing that would sell more than a few hundred copies (although deadEarth bucked the trend and sold over 1,000). The problem was that all the printers he went to required several thousand copies to be printed. So, his pitch to Jamie and Tavis was simply that there were likely other people out there like him who wanted to make niche games and prototypes on a short-run scale. JT estimated that if TGC could sell 100 games per month by the end of the first year, that would be a decent measure of success. Jamie was skeptical, but optimistic. Tavis felt that this was a long shot at best, but somehow let JT convince him to give it a try. Originally, The Game Crafter would be a software only project, and all manufacturing would be outsourced to a third-party. This is how many of the Print on Demand book publishers were doing it, so it seemed like it could work for games. So the three partners approved a budget, assigned a developer and a graphic designer to the project, and launched the beta on July 14, 2009. At launch, TGC offered a small array of pawns and dice, as well as Poker Cards, Large Square Mats, Small Square Mats, Big Mats, and Skinny Mats. It was a modest offering, but manageable for the initial test. Within a couple of days of the launch, TGC was picked up by Tech Crunch, featured on Raph Koster's blog, and even hit Information Week. Between these and other publications around the web, TGC was off to the races. In our first month TGC sold over 300 games! That's a great deal more than even the most optimistic projections. However, even with all TGC's early success, all was not well. The printing company TGC partnered with was unable to keep up with the initial volume of games, and their print quality often had defects. So in October of 2009, TGC leased a facility, and purchased all the printing and cutting equipment needed to service its customers. Over the next eight months, the service's usage grew modestly, but not as much as JT, Tavis, and Jamie had hoped. On top of that, they didn't have any knowledge of the printing business, so they were looking for a new partner to outsource to. Their quick action of opening a facility saved the business, but it was not their first choice. So in June of 2010 TGC partnered with another organization that was widely hailed as having amazing print quality and services. Unfortunately, by July it was painfully clear that they weren't able to keep up with the demand or the quality the partners required. In August of 2010, the partners decided it was time to re-open their facility in Madison, WI. After the partnership fiascos of the past year, Jamie, Tavis, and JT had come to the realization that a decision needed to be made about The Game Crafter: either they needed to own every part of the business and become printing experts, or they needed to shut it down for good. The decision was not easy, and they wrestled with it for several months. Ultimately, it was decided that there was enough interest in TGC to give it a full go. In January of 2011, JT started to rewrite all of the code behind The Game Crafter himself, from the ground up. The shop, the publishing system, the administrative tools, and the back-end factory controls--everything was replaced with a new robust platform. On July 1, 2011, TGC issued a press release titled A Crafter's Manifesto, announcing a new era for TGC. Later that month, on July 21st, the new site was live. That year TGC unveiled more than 100 new features, and has continued innovating ever since. 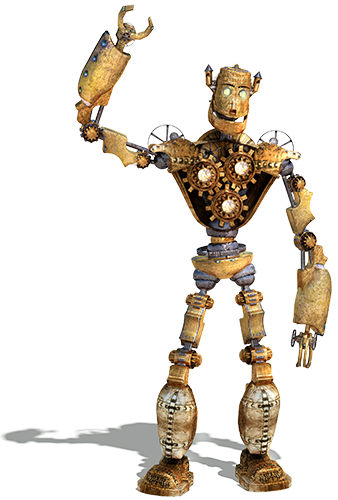 In anticipation of the new site launch, TGC decided it was time to have a community mascot, and introduced Cornelius Oliver Goodfellow, or Cog. He was an instant success with the community. 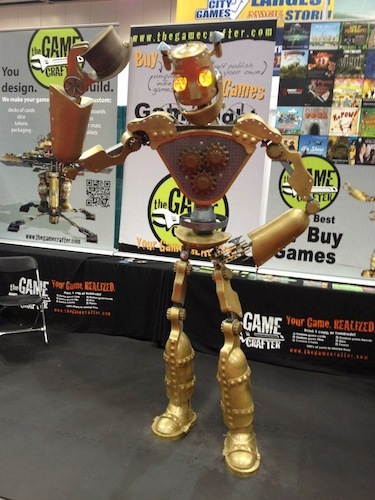 And at Gen Con 2012, the partners unveiled Cog as a special guest at their booth. Over the next two years, TGC continued to innovate new products, adding foldable game boards, many more sizes of cards, mats, tiles, packaging, and more. They also added hundreds of new game pieces to the catalog, and the designer community added thousands of games to the shop. Also during this time, TGC spent a lot of time building and fostering community. TGC started sponsoring designers to go to game conventions, and built a real-time chat system into the site so that designers around the globe could hang out with each other 24/7. TGC also started holding quarterly design contests with cash prizes. In February 2013, TGC unveiled another new site which placed a much larger emphasis on selling games. 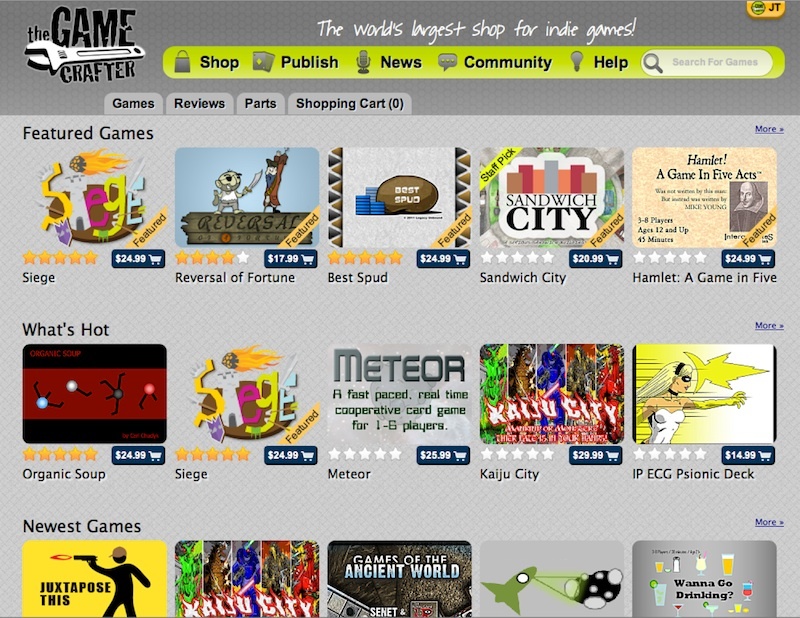 TGC had not only become the best place to make games, but one of the best sites in the world for buying games as well. We couldn't have done it without you! We love you!